The Warrior’s Way ® is a revolutionary program for climbers who want to improve both their performance and their enjoyment of climbing. Mental training is scarcely covered in the climbing literature, yet it is as important to performance as strength, flexibility, and technique. In his unique approach to mental training, Arno Ilgner draws essential elements from the rich "warrior" literature, as well as from sports psychology, and combines these with his extensive climbing experience to create The Warrior’s Way ®. Poor use of attention creates fear, which can manifest itself as anything from performance anxiety to sheer terror. By using attention more purposefully we can understand how fear is created, deal with it effectively, and free ourselves to get back in touch with a far more powerful motivating force: our love of climbing. We can then create the kind of unbending intention that leads to outstanding performance. 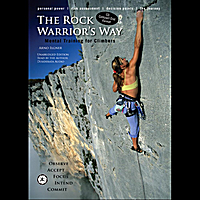 The Warrior’s Way ® is a revolutionary program for climbers who want to improve both their performance and their enjoyment of climbing.